If you want to search the Web with your Droid X, use the Google widget. Type something that you want to search for in the Droid’s Google widget or touch the Microphone button to dictate what you want to find on the Internet. To search for something any time you’re viewing a Web page in the Browser app, press the Search soft button. Type the search term into the box. You can choose from a suggestions list, shown in this figure, or touch the Go button to complete the search by using the Google search engine. Press the Menu soft button, then choose More→Find on Page from the menu that appears. The found text is highlighted in green. Touch the X button when you’re done searching. 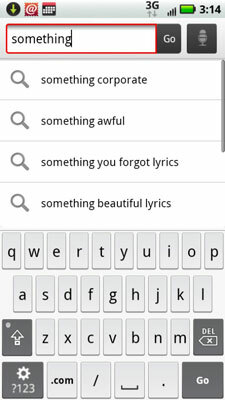 When the text isn’t found, nothing is highlighted on the page; you see 0 Matches displayed beneath the Search text box.